Fiction – paperback; Faber & Faber; 269 pages; 2014. Review copy courtesy of the publisher. Eric Schroder has told lies his entire life. And then, aged 40, they catch up with him in a spectacular way and he’s jailed for kidnapping his six-year-old daughter, Meadow. The book is written in the form of a letter to his estranged wife — an uptight but beautiful Catholic, if you believe his version of events — explaining how things turned out the way they did. It’s an exhilarating, adventure-filled account. The strength of Amity Gaige’s Schroder lies in the voice. Eric is not a person we should like and yet it’s hard not to feel for him. He’s tender, emotional and full of love for his daughter, but he’s also a poor decision maker and slightly deluded. He can’t ever seem to see that his actions will have disastrous consequences for himself and others. We learn pretty early on that Schroder has difficulties with the truth. Indeed, his whole life has been a lie. From a young age he reinvented himself as an all-American boy, even though he was an immigrant who fled East Germany with his father under mysterious circumstances (we never truly find out what happened to his mother, for instance). He gives himself a new surname — Kennedy — and tells everyone he grew up in affluent Cape Cod. Many assume he is related to JFK, and he never disabuses them of the notion. Not even his wife — the woman of his dreams — ever finds out the truth until he spills the beans in this grand narrative that spans his American childhood (in a seedy suburb of Boston), his marriage, his success as a realtor (prior to the global financial crisis of 2008), the birth of his only child, his separation and then the “accidental” kidnap. Much of the book focuses on the kidnap (which he describes as nothing more than “over staying my access visit”). This involves a rather exciting road trip in a “borrowed” Mini Cooper across three states in which the pair have a grand old time eating ice-cream, swimming and staying in “hidden” locations. And while it does, at times, seem reminiscent of Bonnie Nadzam’s Lamb (in which a man kidnaps a young girl for nefarious purposes), the narrative never strays into creepy territory: Schroder’s intentions are well meaning, an act of desperation, if you will, to save a love that he feels is being threatened. 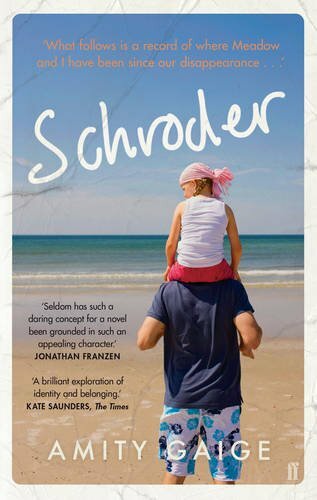 Amity Gaige’s Schroder is a bold, smart novel. Often exhilarating, it also has a quietly devastating effect on the reader. It’s a wonderful, if somewhat offbeat, exploration of father-daughter relationships, of our powerful need for acceptance and of the desperate acts we carry out when life has gone awry. But be warned: if you pick it up, make sure your schedule is clear, because it’s the kind of book that is rather difficult to put down once you start.